Plant AMP is a our OMRI listed calcium product. Plant AMP is also registered with CDFA as an organic input material. Calcium is the basis of cell wall development in a plant and the organic Calcium in Plant AMP is extremely soluble, providing an easily utilized source of Calcium. Plant AMP can be used throughout the entire growth cycle to optimize a plants growth and is approved for organic food crop production. Plant AMP is also a fantastic foliar spray, it is very "clean" leaving no heavy build-up or residue on the plant. 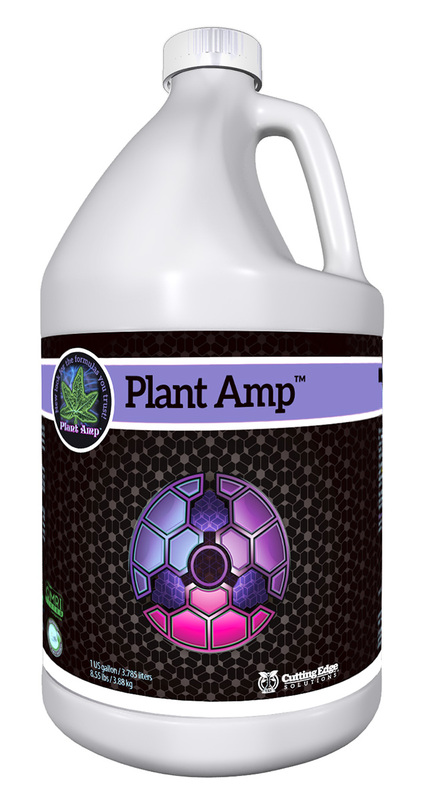 Plant AMP can also be used in conjunction with our full line of additives and base nutrients for custom foliar applications. There is a nuance of Plant AMP that is sure to cause some questions from first time users regarding pH drops after adding it to a reservoir. Plant AMP is derived from organic acids, which will cause a pH drop to around 4 right after mixing, this is essentially a "false" reading. This drop is not caused by a corrosive, strong-bonded acid such as Phosphoric Acid, and will rise on it's own after 24 hours as it breaks down. It is perfectly okay to water with the fertilizer solution immediately after mixing, it will not harm the plant material or negatively interact with the availability of the other fertilizer elements. If a gardener is starting with a low pH source water (typical of R/O water), we recommend adjusting to 7 before adding any fertilizers to the reservoir.